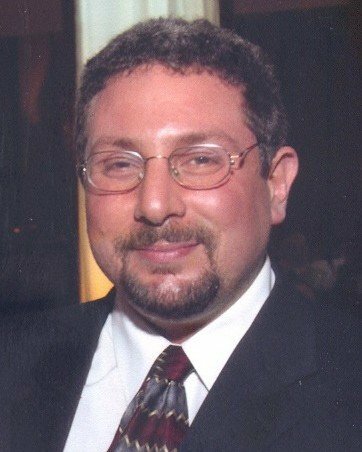 MICHAEL A. VENTRELLA: Today I welcome author William Freedman. His debut novel, LAND THAT I LOVE, was published this year by Rebel and he is currently finishing his second, MIGHTY MIGHTY. His novelette “Forever and Ever, Amen” appeared in the 2006 Spirit House chapbook and his short story “Intentions” is scheduled to be published this year in Ash-Tree Press’s HOLY HORRORS anthology. He is a founding member of the Long Island-based LISciFi critique group and has been a panelist at I-Con, Balticon, Albacon, Capclave and Arisia. He holds degrees in journalism and international business and his non-fiction work has appeared in Investor’s Business Daily, Euromoney Books, Global Finance magazine, Treasury & Risk Management magazine, and many other business and financial news outlets both in print and online. William, what is it in your background that made you want to write LAND THAT I LOVE? Was there some specific political event that triggered the idea? WILLIAM FREEDMAN: When I began writing LAND THAT I LOVE, George W. Bush had just won the 2004 presidential race. (I hesitate to use the term “re-elected” because that presumes he was elected the first time.) Considering all the changes in American politics in the brief time since then, some might not recall the mood of the nation back then. The Republican Party controlled both chambers of Congress as well as the White House, and the Supreme Court was getting more conservative all the time. We were effectively a one-party nation. From Election Day until Katrina, dissent was rarely heard in public. I remember telling a co-worker at the time, “I’m married and raising three kids in a Republican-majority suburb, so I’m a lifestyle conservative. I’m an MBA, so I’m by definition a fiscal conservative. As someone who was in harm’s way during the Gulf War, I’m in favor of military intervention in Iraq, even if I don’t buy the reasons the White House is giving for that intervention. With a few codicils, I’m pro-life. But I don’t believe in rescinding habeus corpus. I don’t believe in warrantless wiretaps. I don’t believe in torture for torture’s sake. But what exactly am I allowed to disagree with the President about and still be considered a good American?” He didn’t have an answer to that. By the way, it didn’t take me five years to finish writing a 55,000-word book. It took me one. But it then took three years to find a publisher and the better part of another to get through the contractual, editing and launch processes. On my blog site, LandThatILoveNovel.WordPress.com, I have a page with excerpts from some of the rejections I got from publishers and agents. At first, nobody wanted to touch the political controversy. Then, after it became fashionable again to criticize Bush, the rejections tended to say that the material was too dated — that by the time they’d be able to get it on the shelves, the war would be over. Of course, the book has been out for the better part of a year now, and we still have a hundred thousand American troops spread between Iraq and Afghanistan. I suppose I get the last laugh, but I’d give it up if it meant bringing them all home. Incidentally, I don’t consider this book anti-war. It’s anti-arrogance. I don’t consider it anti-conservative, as its Amazon reviews would indicate. It’s anti-seeing-the-whole-world-through-only-one-lens. FREEMAN: I never read it. Maybe I should. I’m not really into the whole conspiracy-theory thing. Although there is an element of deception, there are no conspiracies in LAND THAT I LOVE. Everyone’s motivations are pretty clear and nobody’s manipulating anyone. It’s the naked power of a remote overlord versus the scrappy resistance of the proud locals. This plot goes back at least to the Maccabees and almost certainly before that. I do steal the plot straight out of H.G. Wells’s THE WAR OF THE WORLDS with one exception: There are no aliens. In the corner of the Milky Way in which LAND THAT I LOVE takes place, there are no extant, high-functioning non-human civilizations. Humanity has spread throughout the sourthern spiral but hasn’t encountered much in the way of competition. And I think that will continue to be the case. It’s unlikely that we’ll ever encounter anything out there more dangerous than ourselves. VENTRELLA: Given the good reviews you have received, how are you capitalizing on that? FREEMAN: I get a little more respect from my local librarians. And now that I have a book in print and those kind words on Amazon and on the back cover, I feel like I have quite a decent calling card when it comes time to get serious about floating MIGHTY MIGHT, my superhero spoof/social satire, to the agenting and publishing worlds. VENTRELLA: I met you at Albacon, a science fiction convention. Why did you decide to target that audience? FREEMAN: Satire is my canvas, but science fiction and fantasy are my palette. These are the tropes I use. But I belong to a sci-fi/fantasy crit group, not a comedy crit group. Just as I want my writing to work on the gag level and on the message level, it absolutely has to function on the adventure level. Don Adams won the Best Actor Emmy three years in a row because Maxwell Smart, as Adams inhabited him, might spend most the show making faces, delivering a litany of trademark gag lines and stepping on rakes, but in the last five minutes he’d be swinging from chandeliers, winning sword fights, expertly manipulating some world-saving gizmo and outwitting the villains as surely as James Bond or Napoleon Solo or Matt Helm would have. And you wanted him to get together with 99, and you wanted him to impress the Chief. Get Smart worked as a parody precisely because it also worked as character-driven romantic comedy and as the kind of secret agent story that it was sending up. Of course, sci-fi and fantasy auteurs in 2010 take their genre far more seriously than the spy writers of the 1960s did. I’d probably have ruffled fewer feathers in that milieu. Even so, I remain resolute in identifying with sci-fi (which I insist on calling “sci-fi” despite protests from people who are trying to jettison the term in some have-baked, poorly conceived and wrong-headed attempt at gaining respectability) and fantasy. My favorite author these days is Paolo Bacigalupi, whom I’ve been following like a deranged fanboy since “Pop Squad” first appeared in 2006. Over the past couple years, he’s won all kinds of awards and critical acclaim. No less august an outlet as Time magazine showed him love for THE WINDUP GIRL. In a convention green room a few months ago, he was chatting with some other writers and talking about how mainstream publishing pros are telling him to keep doing what he does, but stop calling what he writes “science fiction”. He just laughs it off. I like to think I would too. Not that I’m in any position or am ever likely to be. VENTRELLA: Have you received any negative comments based on the political nature of the book? Or do we just assume that the targets of your book don’t read anyway? FREEMAN: I think history has come down on my side on this one. As unpopular as President Obama is today, he’s still twice as popular as President Bush was in his final year. Even the new wave of Republicans have little good to say about Bush’s policies. A quick word about my own politics. Like I said, I’m an independent. I tend to vote for Democrats at the national level, but I’m just as likely to vote for Republicans in local and state contests. I got my liberal arts degree from a conservative school and my business degree from a liberal school. I’m used to disgreeing, pointedly but respectfully, with my friends, then going out drinking with them afterwards. If you think I’m an extremist, it might be because you’re the extremist and believe that everyone who doesn’t agree with you on every issue is stupid, misinformed or evil. That goes for liberals, who might identify more with my broader beliefs, as well as conservatives. My non-absolutist views on the abortion debate don’t set too well with the left. Abortion doesn’t figure in LAND THAT I LOVE’s plot. I just cite this to call out some increasingly shrill voices who expect their favorite writers to tow a party line. I refer to the former fans of Elizabeth Moon, who vilified her for expressing what I agree is a reprehensible position on how the American mainstream ought to treat the Muslim-American community. I don’t defend her stance, just her right to disagree with the rest of us. Am I supposed to burn my signed copy of ENDER’S GAME just because I’m uncomfortable with Orson Scott Card’s anti-gay rhetoric? Is it inappropriate for me to read Nietszche or listen to Wagner because I’m a Jew and they were anti-Semites? Guess I should’ve never bought that Ford then. I mean, how would those of us who are left-of-center react if Glenn Beck went on the air and told all his viewers to boycott Alec Baldwin movies? If we’re artists, aren’t we expected to draw a reaction — a strong reaction? Can we do that if we’re concerned that we’ll lose our audience if we say something they might disagree with? We won’t ever have to worry about government or corporate sponsorship if we allow others to cow us into censoring ourselves. Yeah, good luck saying something brilliant if you’re always on the defensive against saying something stupid. And good luck getting through the rest of your life without saying something stupid. FREEMAN: No, Mike. Sorry. I tapped that well dry. There’s nothing left. I feel bad for you after all that work. Tell you what: I’ll buy a copy. VENTRELLA: What are you working on next? The reason that world is otherwise indistinguishable from ours is that we ourselves have abilities and talents we don’t use. We all have excuses: lack of ambition, lack of social graces, family responsibilities, better things to do. But we could all be making more of a difference in the world. That’s why so many of MIGHTY MIGHTY’s most powerful characters work as airport screeners or mall cops. Until Fate, i.e., me, steps in to provide them with one last chance at redemption. FREEMAN: Bruce Stirling, Neil Gaiman, Terry Pratchett, Iain M. Banks. I mentioned Paolo already. 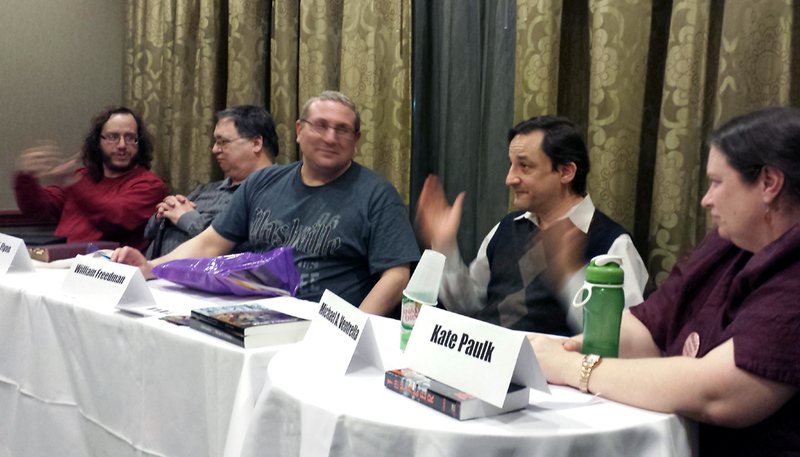 VENTRELLA: What advice would you give to a starting author that you wish someone had given you? What is the biggest mistake you see aspiring authors make? FREEMAN: You can’t copy-edit enough. Ultimately, you have final signoff. Your name goes on the cover and any mistakes that can creep in during the editing process, you own forever. Don’t assume that leaving the editing to skilled professionals is like leaving it to infallible gods. Don’t make that final cut on a screen. Print out all hundreds of pages and read them fresh. In LAND THAT I LOVE, I had what my editor considered an unclear antecedent to the pronoun “his”. There were two possible individuals that could have been referenced, although I can only see the logic in one. She picked the other and replaced “his” with the wrong character’s name. The mistake takes me out of the story every time I read it for an audience — and it’s right there in the first chapter. Maybe I’m being overly sensitive, though, because nobody else has told me they caught the error yet.